The creators of a New York show with a spectacular twist on Victorian toy theatres are aiming to start a new holiday tradition. Toy theaters were elaborate pop-up stage sets made from card, roughly the size of a large book. Children and adults could change the scenes and characters, acting out famous plays, or improvising their own. 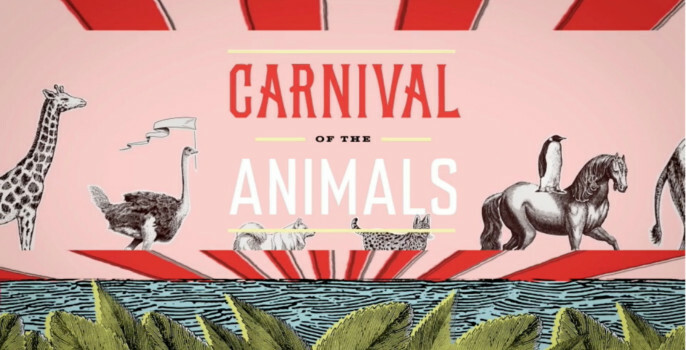 Now the idea is being reset on a much grander scale for Carnival of the Animals, with a rousing 10-piece orchestra, the poetry of Ogden Nash, and over 24 puppets. Based on Saint-Saëns’ musical ‘salute to feathers, fur, and fins’ of the same name, this Miller Theatre production also features Tchaikovsky’s Dance of the Sugar Plum Fairy, as well as curtain-raisers from the 16th century to present-day. The clean lines and dignified designs of Victorian toy theatres provided much of the inspiration for the show’s creators, says Simons. “The thought of adults setting up a miniature theatre and playing all the roles and moving the scenery around was exciting. It encourages make believe. “This is intended for adults and children equally. It has been made with both in mind. I hope the audiences smile a lot. The puppetry style is as unique as the performance style and this can open the door to many surprises. The puppeteers are very physical. “Even though the toy theatres are elaborate there is a simplicity that they evoke: the grand and tiny in one. *Carnival of the Animals at Miller Theatre, 2960 Broadway at 116th Street, is on December 19, 2015, at 3pm and 7pm. Tickets from www.millertheatre.com or at box office 212.854.7799.